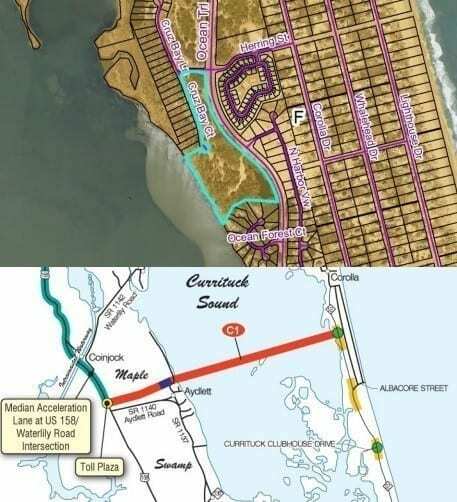 The state Board of Transportation voted Thursday to allocate $5.7 million to purchase a parcel of land in Corolla that would become the eastern landing of the proposed Mid-Currituck Bridge. The 7-acre property is adjacent to the Corolla Bay neighborhood and is owned by Northeastern North Carolina Properties LLC, a division of Towne Bank, which had approached Currituck County leaders several times, including as recently as this summer, for approval to develop the land between the Currituck Sound and N.C. 12. “By purchasing the property now, we are saving taxpayer dollars by purchasing the land at a lower price than it would be if it were to be developed before acquisition,” said NCDOT spokesperson Jennifer Heiss. The span to connect from the mainland community of Aydlett to the Currituck Outer Banks has been in some form of planning for almost two decades, but talk about building a bridge dates back even longer. “Currituck County has been advocating for the Mid-Currituck Bridge since the 1970s,” said County Manager Dan Scanlon. “We are excited to see the acquisition of the right-of-way under way and anxiously awaiting the ground breaking,” Scanlon added. When North Carolina lawmakers revamped how road projects are funded in 2014, among the changes was removing a legislative mandate for the Mid-Currituck Bridge, throwing it back into the same funding pot as other road and bridge projects in the region. The most recent estimated cost of the bridge is at least $410 million, with the state kicking about $173 million in for initial planning, design work and right-of-way acquisition. The rest of the money would come from the sale of bonds that would be paid back using tolls. Within the layout of the Strategic Transportation Improvement Plan, the bridge was ranked low as a regional and statewide priority, but was included on the list of future projects that was finalized last June. “This is a regional project with regional benefits and we extremely thankful for the support of our communities, our citizens and the surrounding counties and towns that have all worked hard in advocating and advancing this project and for their support of the project within the Strategic Transportation Investment program,” Scanlon said. 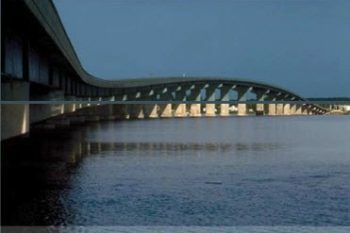 $1,235,505 was previously approved for appraisal and advanced acquisition of specific parcels for the proposed 7-mile-long, two-lane bridge. The state Board of Transportation on Thursday granted a request for an additional $5,702,571 from the state’s Highway Trust Fund, which is supported primarily by revenue generated by North Carolina’s motor fuels tax. “If the property were to be developed prior to us purchasing it for the project, it would be of greater expense and we would also have to pay to relocate residents whose homes we would have to purchase,” Heiss said. The most recent timeline for the bridge would have construction starting by the end of the decade, and the span open to traffic by 2025.